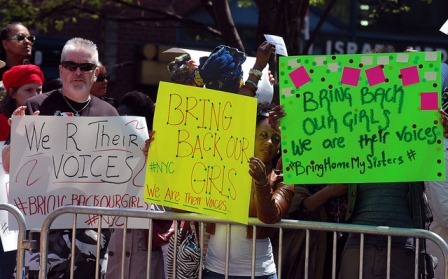 Hundreds of people gathered at Union Square in New York City on May 3 to demand the release of the Nigerian schoolgirls abducted by Boko Haram. New claims that parts of the Nigerian government share the anti-Christian convictions of Boko Haram have emerged since the group’s abduction of hundreds of school girls, most of who were Christian and are still missing, one month after the incident. Dali said many of the parents are “disappointed in the government and wondering if they will ever get these girls back,” especially since they have not received any consultation and claim to be treated as if the abduction never happened, aside from a visit from the Governor of Borno State immediately afterward. Instead, Dali said, parents are putting their hopes in international assistance. “The news of the international community coming has also raised their hopes, and they believe that justice will be found through the international community,” he said. Sharon Ikeazor, a representative of the Nigerian opposition party, the All Progressives Congress, visited London last week asking for help. According to Amnesty International, Nigeria’s military headquarters was aware of the impending attack soon after 7 p.m. on April 14, close to four hours before Boko Haram began its assault on the school housing the girls. The federal government had only “woken up” to Boko Haram’s abduction of the hundreds of schoolgirls when there was global outcry; Nigerian President Goodluck Jonathan only called for a discussion 19 days after the abduction because of the international attention said Shettima. Ikeazor said the reason the girls are still missing is largely due to the military being ‘demoralised’ and ‘corrupt’ and therefore they are ‘not willing to risk their lives’ against the better-equipped Islamist militant group Boko Haram. “The most important thing is getting the girls back alive and that is why we are asking for international help”, Shettima said. 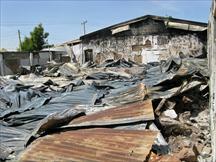 Several countries are providing assistance to the search effort, though the Nigerian government has shown some reluctance. CNN has reported that U.S. drones and manned surveillance aircraft are being used. CNN also reported that, following the security summit on May 17 in Paris, Nigeria agreed with its four neighboring countries to share intelligence and border surveillance. The United States, United Kingdom and the European Union will provide technical expertise and training to the new regional African effort against Boko Haram.